Stairs and Landings can seem difficult to build, if you have never built them before. But if you understand and learn some of the basic concepts of stair design and construction, you can begin building stairs for all of your projects. 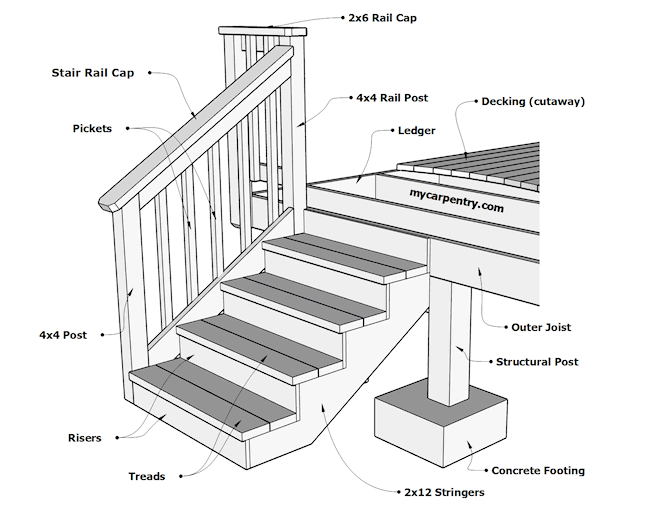 This page provides quick access to the stair building resources available on mycarpentry.com. From here you can access the stair calculator; find information about laying out and cutting stringers; learn how to build stairs with landings; and how to design and install stair railing. 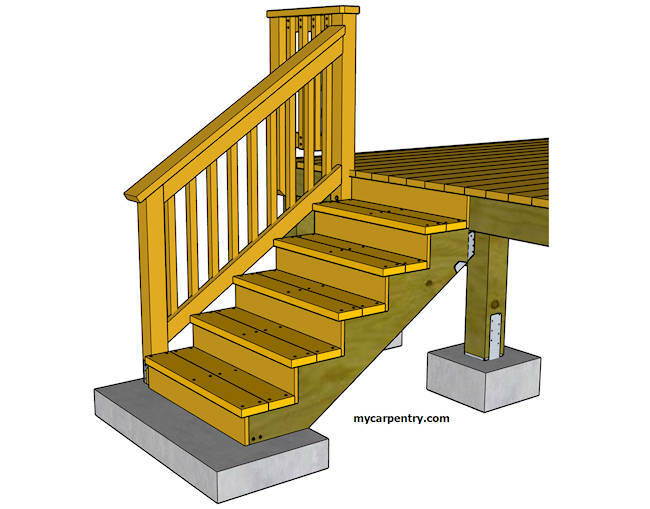 Custom Stairs - describes how to design and build a set of free-standing custom stairs using mycarpentry.com's Stair Calculator and Sketchup Pro. This article describes how this combination of design tools can be used to build stairs for a travel trailer or RV. Stair Calculator - the stair stringer calculator comes in two forms; the automatic stair calculator, for calculating rise and run on straight-forward stair designs; and the manual stair calculator (designed to be flexible), for calculating stairs with a non-standard rise and run. Building Stairs - learn the fundamentals of building and designing stairs; how to manually calculate stringer rise and run; and how to lay out and cut stair stringers. Stair Landings - learn how to add landings to your stair designs. Landings help break up long runs of stairs and provide a place for a person to rest before the next climb. Stair Railing - learn how to determine the dimensions and angles of the stair rail parts, and install stair railing. This tutorial shows how to design stair railing so that it ties in with the railing of the upper deck or landing. There are lots of scenarios when designing and building stairs and landings. Landings can be just about any size, so long as they meet minimum building code requirements. Depending on the type of usage, whether residential or commercial, you must comply with local and international building codes. That is, if you intend to request a building permit for your project, which is highly recommended. If there is any particular information you would like to see added to this page, please don't hesitate to contact us.